Gift shop and greeting card stores are both classified under the same census heading as gift store, novelty shop and souvenir shops. They are often located together with gift shops selling greeting cards and vice versa. But, both industries are popular and very profitable businesses in their own right. The gift shop industry began as a small industry with stores in airports and tourist areas but has grown into a multimillion dollar business. Owning a gift shop can be a busy, exciting job calling for entrepreneurial knowledge and skills in financial, inventory, human resource management and marketing areas. Owners are learning that store loyalty is a luxury of the past. Now stores must be unique and different from each other to attract and keep customers. The greeting card is the cornerstone of the gift, novelty and souvenir shop industry and is in the mature phase of the business life cycle. This means that this industry’s growth has closely resembled that of the overall economy.1 According to the Greeting Card Association, Americans bought 7 billion greeting cards in 2005.9 Ninety percent (90%) of Americans surveyed said that they like to receive greeting cards and personal letters from friends and family, preferring greeting cards to e-mail, text messaging and phone calls. “We live in a souvenir society, a world in which everything we do, everywhere we go, has to be commemorated,” said Charles Gordon, writer for Maclean’s magazine.3 Because of this, the gift shop industry has expanded from small operations in airports and tourist destinations into a multimillion dollar industry. Gift shops primarily sell a combined line of gifts and novelty items, souvenirs, greeting cards, holiday decorations, and miscellaneous items. 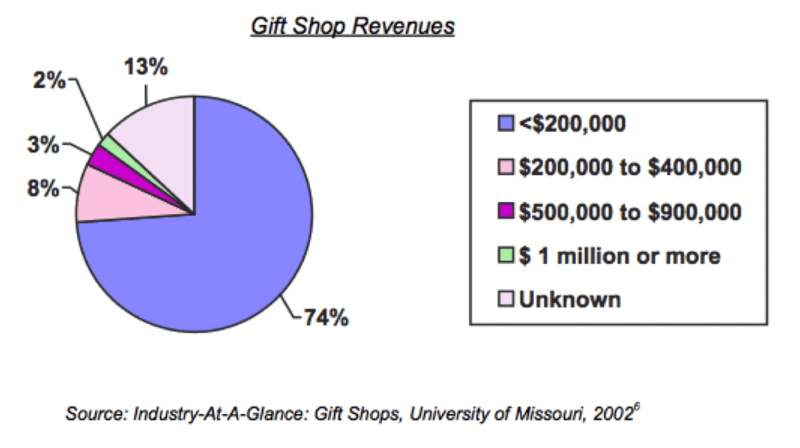 Seventy-eight percent (78%) of America’s gift shops employ only one to four employees and 75% have less than $200,000 in annual sales.6 The major companies in this industry include the Yankee Candle Company, Party City Corporation, Kirkland’s, Inc. and Luxotica Group S.P.A.
“When you care enough to send the very best…” Almost everyone has heard this phrase by Hallmark on television or radio, seen it on the Internet or even written on the cards they send and receive. The greeting card industry, although lumped together with the gift, novelty and souvenir shop industry, is a cornerstone of this industry and produces sales of $7.5 billion. The custom of sending greeting cards can be traced back to the ancient Chinese who would exchange messages of good will for the New Year. The early Egyptians used papyrus scrolls to write and send greetings. By the 1400’s, handmade paper greeting cards were exchanged in Europe. The first Christmas card was created in 1843 in London and the first Valentine’s card can be traced back to 1415.1 By the 1850’s the greeting card had transformed from an expensive gesture to a popular, affordable way to convey personal messages. A German immigrant, Louis Prang, is credited with starting the greeting card industry in America with the establishment of his lithograph business that perfected the color lithograph process.1 Most of the greeting card companies that exist today were formed after 1906. By the 1980’s alternative greeting cards began appearing on the market. These were cards not necessarily intended for a special occasion, but to serve as a reminder of personal and sentimental connections among friends. Greeting cards are categorized as either seasonal or everyday and total sales appear split evenly between the two. The frontrunner in the greeting card industry is Hallmark Cards Inc. The company has been the undisputed leader due to their presence in manufacturing and retailing.3 Hallmark was founded in Kansas City, KS as a wholesale postcard business in 1910 by Joyce Clark Hall. Hall chose this city because of its proximity to the railroad and its reputation as a major wholesale distribution area. Hall’s brother, Rollie, joined her at the company. In 1912, Rollie noted a downturn in postcard sales and quickly added greeting cards to their product line. Because the greeting card had space for written personal messages and was enclosed in an envelope, the idea caught on quickly.8 Hallmark opened its first retail store in 1950 establishing a dominant position in the industry. American Greetings and Gibson Greetings were next in market share, but in 2000 American Greetings acquired Gibson Greetings. As stated above the greeting card industry is big and it continues to grow. An article in DSN Retailing Today cites that more than 90% of households buy greeting cards and the average household buys 30 greeting cards a year. Eighty-seven percent (87%) of households buy at least one greeting card a year for an everyday occasion and 70% buy a seasonal card.7 Women purchase 80% of all greeting cards and regularly buy several cards at once. While men usually buy just one card at a time, they tend to spend more on a single card than women. Gift shop owners are discovering new techniques to woo and keep the modern, mobile, value-conscious consumer. Store loyalty is not as secure as it used to be. If a store does not carry items that the customer wants or needs, then she will likely continue her search elsewhere. In order to maintain a competitive advantage, it is important for gift shops to be unique and offer items not found in other stores. 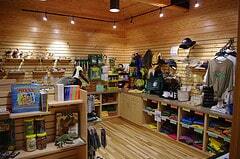 One rapidly growing trend in gift shops is the use of technology. Shops without computerized systems or an Internet presence are at a disadvantage. Computerization and software allow the gift shop owner to keep track of revenues, product movement, and the customers themselves. Approximately 75% of all stores have an online presence. E-cards are becoming popular with consumers today forcing traditional greeting card manufacturers to diversify and enter this new market. In a survey by American Greetings, 95% preferred to remain connected to friends by e-mail and 75% prefer to receive and send cards online. E-cards continue to gain popularity yet people are still buying traditional cards. Consumers in the United States buy 7 billion greeting cards each year generating an annual industry sales of $21.4 billion.10 To restate a startling statistic – almost every household in America will purchase at least one greeting card a year and typical households buy 30 greeting cards in that time. Although the card industry feared that e-cards would signal the demise of the traditional greeting card, sales have risen since 2000. Consumers now send both e-cards and traditional cards. According to analysts, sales of e-cards have also increased due to convenience and awareness of online transactions. Diversification and unique offerings make the difference in the fragmented gift shop industry. Updated operations, awareness of current trends and tracking customer preferences will give savvy shop owners a leading edge toward success in this line of business. Greeting card manufacturers continue to develop their products in response to public demand and technological advances. Consumer comfort level with online purchasing and digital delivery will impact the market greatly. 7 Traditional Cards Thrive in Post E-Greeting Era, DSN Retailing Today, 2001. 8 Hallmark Cards Inc. Notable Corporate Chronologies. Online Edition. Thomson Gale, 2005. 9 Greeting Cards.” Encyclopedia of American Industries. Online Edition. Thomson Gale, 2006. 10 “Gift, Novelty and Souvenir Shop: Industry Analysis.” Zapdata Industry Report. Dun and Bradstreet, 2005.